I first heard about this strange chapter of North Carolina folklore from a mountain man named Bobby McMillan, whom I met when I lived in Hickory, North Carolina in the mid-1970’s. Because he was the third cousin to Charlie Silver, the man Frankie was accused of killing, Bobby had been collecting stories, songs and lore about Frankie Silvers since he was a small lad. The story takes place in what is now Mitchell County, North Carolina, between the Blue Ridge and the Allegheny mountains. It was there, near a branch of the Toe River, that Charlie Silvers built a one-room pole cabin out of round logs. A handsome young man who was just 20 years old, Charlie was known both as a good dancer and also as a good singer. At 19-years old, his wife Frankie was considered a pretty girl and also a good dancer. Just before Christmas one year, Charlie was getting ready to go hunting up on the Tennessee line. A bad snowstorm was raging, so in order to keep his wife and baby daughter warm while he was gone, Charlie chopped down a hickory tree. After he had split all the wood and stacked it on the porch, Charlie came in covered with ice and snow and laid down in front of the fire to get warm. He took his baby daughter, Nancy, in his arms and soon fell asleep. This was Frankie’s chance to kill Charlie. No one knows why Frankie wanted to murder her husband. Some say it was jealousy, while others say that Charlie was a violent man who frequently beat Frankie. What is certain is that Frankie took the baby from Charlie’s arms and then struck him a blow with the axe as he lay sleeping in front of the fire. After she hit him, he screamed, “God save the child!” She immediately dropped the axe and hid in the bed under the covers. After some time, she heard no sounds, so she came out from under the quilts and found that Charlie was dead. That night, Frankie, possibly with the help of her father, cut up Charlie’s body with the axe and burned him in the fireplace with the wood that Charlie had cut, split, and stacked on the front porch. They hid the internal organs, which wouldn’t burn, in a hollow stump some distance from the cabin. The next day, Charlie’s step-mother, Nancy, and her sisters were washing clothes in an old washpot in the yard when Frankie came walking down the hill with her baby. Frankie told them she had been washing and cleaning her cabin all morning. When asked where Charlie was, Frankie said he had gone across the river on the ice to get his Christmas liquor and had not yet returned. When Charlie didn’t show up the next day, Frankie took the baby and went to stay at her father’s house. Before she left, she boarded up the door and windows. Meanwhile, Charlie’s father became concerned because his son hadn’t come back, so he and a party of men went to nearby Tennessee looking for him. There he found a fortune teller whose conjure ball indicated that Charlie, or his remains, was still in the cabin. Jake Collis, one of Charlie’s friends, was also suspicious that Charlie had been murdered. Accompanied by the Sheriff, Jake went to Charlie’s cabin. After prying off the boards that Frankie had nailed over the door and windows, they found the one-room cabin had been scrubbed spotlessly clean. Investigating further, the Sheriff noticed that the ashes in the fireplace looked greasy. He and Jake then raised up the puncheon in front of the fireplace and found blood stains on the dirt, along with teeth and chips of bone. The axe that lay nearby was unusually dull, as if it had been chopping something other than wood. Just then, Frankie, who had been hiding in the woods, burst into the cabin and started screaming like a wild animal. After the dogs led Jake and the Sheriff to more of Charlie’s remains that were hidden in a hollow stump, the Sheriff arrested Frankie and charged her with murder. At her trial Frankie pled not guilty, but the all-male jury convicted her, and Judge Donnell sentenced her to die. Due to North Carolina law she was not allowed to testify at her own trial. The sentence was appealed, but it was sustained by Judge Ruffin. Frankie was not without her supporters. Thirty-four women from the community signed a petition to set her free, but Governor David L. Swain refused to grant a pardon. Even though seven members of the jury signed a petition saying they didn’t think she should be hanged, the governor made no response. People came from miles around to witness the hanging. Her last request was a piece of cake, which was soon brought to her. Before she was hanged, they asked if she had anything to say. She said she did, but when she started to speak, her father hollered, “Die with it in you Frankie, die with it in you.” So, she closed her mouth, and never said another word. Instead, she pulled the black mask down over her face. She was hanged July 12,1833. Some claimed that after the execution, Frankie’s family became cursed. Her father was killed by the falling limb of a tree, and her mother died from the bite of a copperhead. Her brother moved to Kentucky where he was tried and convicted as a horse thief and hanged. Some stories claim that Frankie herself composed the ballad known as “Frankie Silver,” and sang it from the scaffold. Alfred Silver, interviewed in 1903, claimed it was “printed on a strip of paper and sold to people who were assembled at Morganton to see Frankie executed.” However, no examples of the broadside were ever found, and it was doubtful that a printing press existed in that region at that early date. The song was apparently first printed in a local newspaper in 1885, under the title, “Frankie Silver’s Confession.” However, one reader, Harry Spainhour, claimed that it was actually written by a 17-year-old co-worker named Thomas W. Scott. It is doubtful that Frankie composed the ballad. After all, she could neither read nor write. And I must leave this world at last. These prison walls I leave at last. Until I’m numbered with the dead. Oh Lord! What will become of me? I am condemned, you all now see. All in a moment when I die. Gnawing his flesh in misery. For murder in the first degree. His chattering tongue soon lost its sound. It strikes with terror to my heart. But try to serve your God in time. What my bad conduct’s bro’t on me. Before this world of human race. When it was collected by Frank C. Brown of Duke University, the ballad was in 3/2 time, so I have put it in a more singable rhythm and have also changed the melody slightly and added the chords. 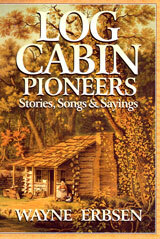 You can find it, and much more, in my book, Log Cabin Pioneers by Wayne Erbsen.